While the pre-2015 MCAT only tests you on science and verbal, you are still required to perform complex mathematical calculations WITHOUT A CALCULATOR! You may get stuck in knowing how to apply math to the required science question. Perhaps you know the required math but feel lost without your calculator. Even if you do know how to do the MCAT math without a calculator, you find yourself wasting too much precious time working through the calculations. So as you prepare for your MCAT you should be focusing on learning the required math in addition to studying your sciences and practicing verbal passages. The above video explains why you need math shortcuts on the MCAT and how to use these shortcuts effectively to save time and still get the correct answer to detailed MCAT questions. How many moles of Chlorine Ions are found in 4.93L of a 0.096 molar solution? You are so amazing for sharing this with us! I appreciate you so much. Hi. Thank Your for your videos. They are very helpful. Do you also have a site for SAT practices and all other stuff? You’re welcome! I just focus on Organic Chemistry and MCAT topics! These videos are extremely helpful–especially the trig and log videos. Thank you so much for sharing your tricks. Best. 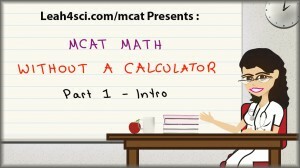 Thank you so much for these video series, it’s a HUGE help especially for someone like me who depends on calculators. Just a quick question, if I am multiplying two decimal numbers and I round one up but the other down, how should guesstimate my answer would be? You mentioned if both numbers are rounded up then your actual answer should be less… so what if one is up and the other is down? Leah, I am from Brazil and I never had seen a clear explanation the way you do. Thank you very much. I would like to have you tutor me…so question how much do you charge? I can’t see the link! These tutorials were great! Do you have any suggestions for where I could find practice problems to keep these skills sharp? Thanks Laura, are you referring to math or MCAT science?